These are both books about love and both completely different. I couldn’t decide which one to choose, so I am posting both. The first is an ebook; the second a regular hold-in-your-hand hardcover book. Enjoy! This is the key to Mary’s new book, hot off the Internet, fully illustrated with colorful collages and original poems by the author. Her inspiration is apparent on every page of this short, but powerful ebook. Early on she asks us: “How can we become wholehearted?” I don’t think I have ever been asked that question. Mary develops this bold concept with the use of quotes, visuals, and text that challenges us to look at the state of the world with a whole heart in order to heal the planet. Some of you might think this book is what we used to call â€œpie in the sky,â€ (Not even sure what that means!) but if you met Mary Margaret Woods, as I have, you will know that her ebook truly reflects what is in her heart. When you are in her presence, you can easily understand how this book reflects her vision, her dreams, and her hope for love and peace on our planet. Mary’s message is simplistic and heartfelt: “The heart is the key to our hearts.” After reading it, I think you will be inspired to look within your own hearts to foster Love of self, Love of others, and Love of the planet. We all need this Love more than ever—Love with a capital L.
Mary, and her husband Dave, who helped Mary with her creation, invite you to preview the book and its “wholehearted” message. You can preview excerpts from each of the eight chapters in a four-minute, forty second flash presentation read by Mary herself, who has a wonderful voice. 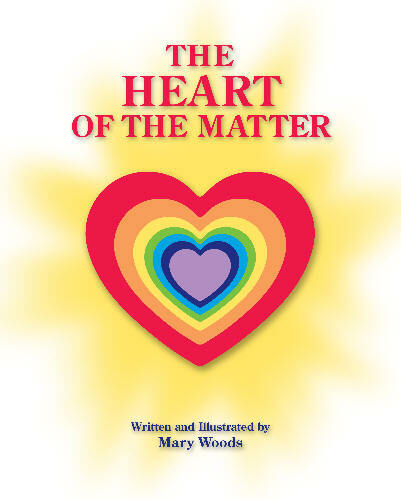 Click onto: www.theheartofthematter.us to read and hear Mary’s excerpts. Since this is an ebook, there is no paper, no postage, and no waiting to read it. (This in itself is a new experience for me.) Mary’s book is a perfect Valentineâ€™s Day gift and a message that is perfect for every day thereafter. The cost is $8 (plus $.48 tax in PA only), an amount that won’t lighten your pocketbook, but will definitely enlighten your heart. Dismissing the arranged marriage of Lionel Rothschild to his first cousin, Charlotte Rothschild, as simply a business decision brokered to insure a financial empire would be easy. That it is a happily-ever-after love story makes a merely interesting story irresistible. In Charlotte and Lionel: A Rothschild Love Story, author Stanley Weintraub, Evan Pugh Professor Emeritus of Arts and Humanities at Penn State University, tells of a marriage of influence. The two Rothschilds he writes about lived in different countries: Lionel lived in England and Charlotte in Germany. (She moved to England after the marriage.) The marriage was arranged by both the â€œshrewd and formidableâ€ mother of Lionel and the â€œelegant and society-focusedâ€ mother of Charlotte. The book chronicles the life of the two cousins, including the death of a beloved daughter and Lionelâ€™s declining health from rheumatoid arthritis. 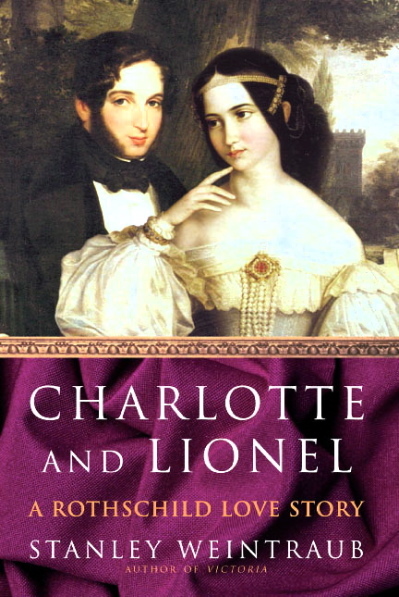 Lionel died in 1879 and Charlotte survived him by five years. Charlotte and Lionel is an extensively researched book that brings the Rothschilds to life, making them real people, not just wealthy aristocrats with lots of leisure time. Truthfully, I expected the book to be dry, but Stanley Weintraubâ€™s writing and the story itself was extremely engaging and a heartwarming love story. The book was released in February 2003 by The Free Press. The hard cover book sells for $27.50 and contains 336 pages— A good read for Valentine’s Day. Note from Ellen Sue: On March 9, 2003, a longer version of this review appeared in The Centre Daily Times in State College. Previously, I had met the Weintraubs when they were guests at our local writersâ€™ group and I received a review copy of the book. Weintraub, and his research partner/wife Rodelle, spent many hours reading the Rothschild family papers housed in the Rothschild Archive in England. These include letters and childrenâ€™s books written by Charlotte. The many personal details in the book are proof of this extensive research. You are currently browsing the Menupause weblog archives for February, 2008.